When you became a landlord or a property manager, you signed on to a tough job. There are a lot of daily tasks that you need to complete to make sure your tenants are happy and pay their rent on time. However, one of the hardest parts of the job can be having to evict tenants. Putting someone out of their home can make you feel rotten, but it is your job to make sure that you get paid and that your property is taken care of. Also, the eviction process can slow down your income flow by waiting for that property to be filled again. Eviction is not fun for the tenants, and it is not fun for the property manager. 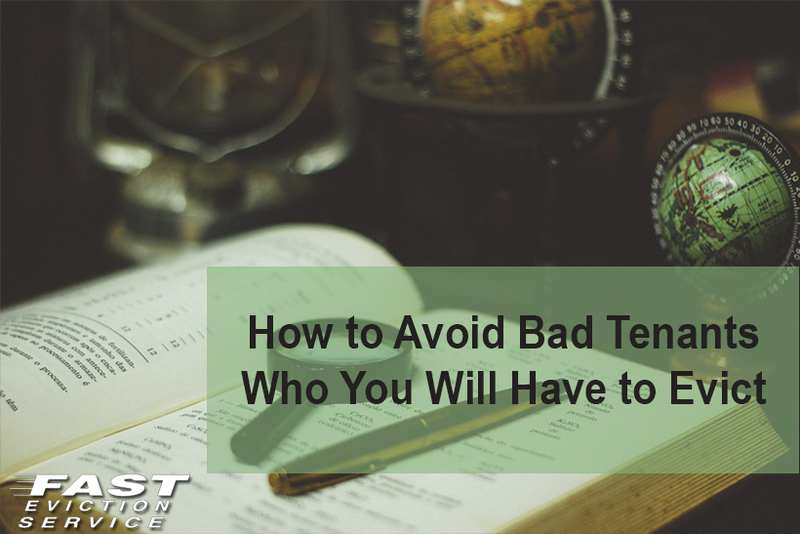 Instead of waiting around for the eviction process to take place, you can take steps to avoid it from happening at all by not renting to bad tenants. This will help you become a better landlord and continuing to make an income, all the while keeping your tenants happy. This is the obvious way to prevent getting bad tenants that you will have to evict. Many landlords want the property filled right away. Try to avoid this common mistake. Instead, you can be strict about who you want to fill the vacancy. It may take a little bit longer to have the property filled, but once it is filled you will have a steady income from someone who would have a low possibility of getting evicted. So instead of repeating the same process of filling and evicting your property, you can keep your income steady with one good tenant. Finding good tenants can be tough, but the first step is with a quality advertisement. Make sure you put the requirements in the ad. You will get less calls, but everyone who does call will have read the requirements, and want to take this to the next step. By putting an income, employment, and references requirement in the ad, you will weed out all of the lower quality tenants and only get calls from qualified applicants. That way, you can focus all of your attention on those who are qualified to rent the property, instead of showing the property to someone who does not have the qualifications. This would waste your time, and the property viewers time. Once you go through the tough process of finding a good tenant, you need to make sure that they know the rules of your property. Make it very clear at the signing that late rents and missed payments will not be tolerated, and be sure that they know that they will get evicted if they do not pay up. By being candid right away you can avoid future problems. If your tenant is qualified, they will have nothing to worry about! When they sign the agreement, give them a copy of the rules so they have a continuing reminder about what they agreed to. Many people try to take advantage of their landlords. By being straightforward with your tenants and letting them know the rules, this will prevent a lot of future headaches and evictions. It is also wise to avoid personal relationships with your tenants and keeping the relationship strictly professional. This will benefit you both by making sure you have a quality tenant, and by making sure that the tenant will not get evicted. This honesty and straightforwardness will prevent future mistakes by letting the tenant know exactly where you stand. Some tenants try to ‘test’ their landlords to see how lenient they will be. Being upfront will avoid them doing this, and avoid evictions. If they know exactly where you stand, it will be a mutually beneficial relationship. Being a landlord is a hard job, but by attracting high quality tenants, your job will be much easier. If your tenant pays the bills on time and takes care of the property, you and the tenant will both be mutually happy. Sometimes you will need to get tough with a bad tenant, but they do need to respect that it is your property and the rules will need to be followed. By following the tips above and avoiding the eviction process, you will avoid bad tenants and everybody will win!